Faculty of Medicine Department of Endemic Medicine Helwan University Cairo, Egypt. Citation: Sabri YY, Taymour T, Metwalli ZM, et al. Multislice CT criteria of hepatopulmonary syndrome in patients with post HCV liver cirrhosis. J Gastroenterol Dig Dis. 2017;2(3):42-46. Hepatopulmonary Syndrome (HPS), MDCT, Post Hepatitis C.
Lung complications may occur as a result of hepatic disease from any cause and represent a highly heterogeneous group of conditions. Early recognition of such complications may be challenging but is crucial in avoiding severe sequelae and irreversible damage. The prevalence of HCV infection varies throughout the world, with the highest number of infections reported in Egypt. Accordingly, Egypt has the highest HCV prevalence in the world; prevalence of anti-HCV antibodies is 10-fold greater than in the United States and Europe . Cirrhosis is defined as the histological development of regenerative nodules surrounded by fibrous bands (i.e., the conversion of normal liver architecture) in response to chronic liver injury, that leads to portal hypertension and end stage liver disease. It is not a reversible process. The term cirrhosis was first introduced by Laennec in 1826. It is derived from the Greek term scirrhus and refers to the orange or tawny surface of the liver seen at autopsy . Cirrhosis has many possible causes; sometimes more than one cause is present in the same patient. Globally, 57% of cirrhosis is attributable to either hepatitis B (30%) or hepatitis C (27%). Alcohol consumption is another important cause, accounting for about 20% of the cases (3). Other etiological factors include NASH, primary biliary cirrhosis, primary sclerosing cholangitis, autoimmune hepatitis, hereditary hemochromatosis, Wilson’s disease, alpha 1 antitrypsin deficiency, cardiac cirrhosis, galactosemia, glycogen storage disease type IV, cystic fibrosis and hepatotoxic drugs or toxins . irrhosis is frequently indolent, asymptomatic and unsuspected until patients present with dramatic and life-threatening complications, such as portal hypertension and variceal hemorrhage, ascites and spontaneous bacterial peritonitis (SBP), or hepatic encephalopathy. Other major complications of liver cirrhosis include hepatorenal syndrome and hepatocellular carcinoma and liver cell failure . Due to its low level of complexity and its fairly good predictive value, the Child-Pugh-Turcotte (CPT) classification is widely used to both characterize the degree of liver injury and predict the prognosis of patients with cirrhosis based on clinical and laboratory parameters (Table 1) . Child Class A: 5-6 points; Child Class B: 7-9 points; Child Class C: 10-15 points. Table 1: CTP scoring system for cirrhosis . Ultrasonography, CT and MRI are not sensitive to detect cirrhosis, and final diagnosis still relies on histology. However, their specificity is high when an obvious cause is present and imaging reveals an inhomogeneous hepatic texture or surface, rarefied hepatic central vein, atrophic right lobe and hypertrophy of the left and especially caudate lobes, splenomegaly or collateral veins. The major role of radiography is for the detection and quantitation of complications of cirrhosis, i.e., ascites, HCC, and hepatic or portal vein thrombosis . Various thoracic complications may occur in patients with chronic liver disease. Among these complications are hepatopulmonary syndrome, portopulmonary hypertension, intrathoracic portosystemic collaterals, hepatic hydrothorax, acute respiratory distress syndrome (ARDS), infection and intrathoracic manifestations of HCC . HPS is defined as the triad of liver disease, arterial hypoxemia (arterial oxygen tension less than 70 mmHg) and intrapulmonary vascular dilatation . Increased endogenous nitric oxide (NO) production appears to be the key priming factor for the development of pulmonary vascular dilatation Proposed contributing factors to the pulmonary microvascular dilatation observed in HPS include angiogenesis, vascular remodelling, pulmonary arteriovenous shunts and portopulmonary venous anastomoses . It is found most commonly in the setting of cirrhosis and manifests clinically as progressive dyspnea, cyanosis, spider nevi, clubbing, hypoxemia, platypnea and orthodeoxia . CT findings of HPS include dilatation of distal peripheral lower lobe pulmonary arteries that do not taper normally and extend out to the pleural surface, and juxtapleural telangiectasia in type I and nodular dilatation of peripheral pulmonary vessels in type II . Type 1, the most common type (86% of cases), may be associated with a good oxygenation response to 100% inspired oxygen and is more likely to benefit from liver transplantation whereas type 2 patients (14% of cases) may respond poorly to supplemental oxygen and are better candidates for coil-spring embolization . The aim of this work was to explore the role of MDCT in HPS. This study involved 63 Egyptian patients; 40 males and 23 females, age ranging from 25 to 74 years (with an average of 54 years). All recruited patients signed an informed consent form and the study was conducted in concordance with ethical considerations and an approval was obtained from the relevant ethical committee. All patients were known cases of posthepatitis C liver cirrhosis. Cases were referred to radiology department of the National Hepatology and Tropical Medicine Research Institute (NHTMRI) for CT abdomen and pelvis (with oral and IV contrast) in the period between October 2013 and March 2014. 1. Thorough history taking and clinical examination. 2. Liver function tests (Total, direct and indirect bilirubin, AST, ALT, ALP, albumin, PT, PC and INR). 3. Arterial blood gas samples for PO2 obtained by percutaneous radial artery puncture with the subject in a seated position breathing room air, and were analyzed with a standard blood gas analyzer. Hypoxemia was defined by a PO2 less than 70 mmHg (Table 2). *denotes statistically significant result (p<0.05). Table 2 : CT findings of the studied patients. 4. CT abdomen and pelvis (with oral and IV contrast) for assessment of liver using Toshiba Asteion 4. 5. 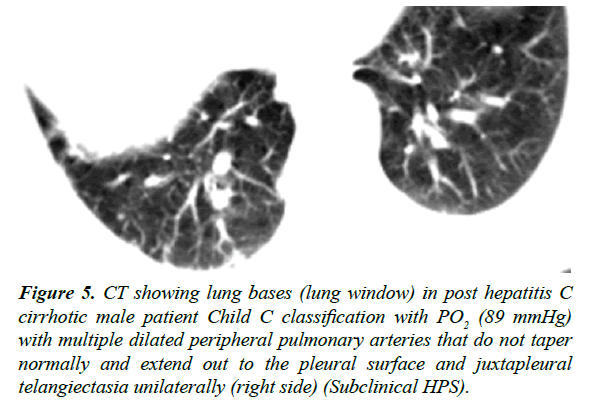 Evaluation of lung bases in lung window was done for all patients for the presence of: Dilated distal peripheral lower lobe pulmonary arteries that extend to the pleural surface, juxtapleural telangiectasia and nodular dilatation of peripheral pulmonary vessels. Out of the 37 patients that were found with positive CT findings in the study, 32 patients (86.4%) showed these findings bilaterally as compared to 5 patients (13.6%) whose findings presented unilaterally. Furthermore, 94.5% (35 patients) showed CT features of type 1 HPS while CT features of type 2 HPS were seen in only 6.5% (2 patients). Out of the 37 patients that were found with positive CT findings in the study, 19 patients (30.1%) showed hypoxemia (PO2 <70 mmHg) i.e., overt or clinically significant HPS and 18 patients (28.6%) were normoxemic which is defined as subclinical HPS or intrapulmonary vascular dilatation syndrome (IPVDS). 41.3% (26 patients) were negative to both CT findings and hypoxemia (Table 2). The study included 17 Child A, 27 Child B and 19 Child C patients. 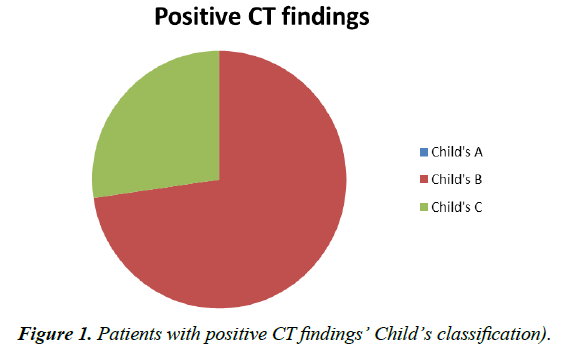 None of the Child A patients, 23 Child B and 16 Child C patients presented with CT findings impressive of HPS (Figure 1). Figure 1: Patients with positive CT findings? Child?s classification). Aside patients’ Child’s classification, portal hypertension that is known to develop in two thirds of cirrhotics was owed to be correlated with the study results where 27 of the 37 patients with positive CT findings i.e., 72.9% had portal hypertension. Moreover 23 patients out of the 37 with positive CT findings (63.6%) had HCC (Figures 2-6). Figure 2: CT showing lung bases (lung window) in post hepatitis C cirrhotic male patient (Child B) classification with PO2 (62 mmHg) showing multiple dilated peripheral pulmonary arteries that do not taper normally and extend out to the pleural surface and juxtapleural telangiectasia bilaterally more on the left side (Clinically significant HPS ?type 1?). 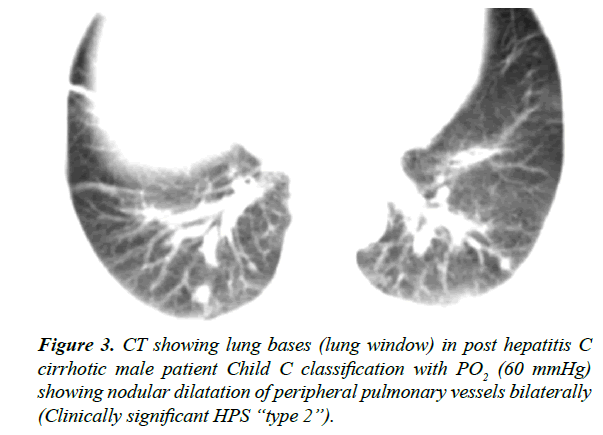 Figure 3: CT showing lung bases (lung window) in post hepatitis C cirrhotic male patient Child C classification with PO2 (60 mmHg) showing nodular dilatation of peripheral pulmonary vessels bilaterally (Clinically significant HPS ?type 2?). 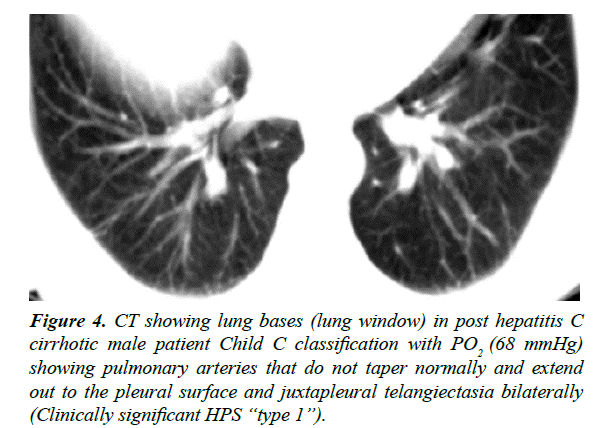 Figure 4: CT showing lung bases (lung window) in post hepatitis C cirrhotic male patient Child C classification with PO2 (68 mmHg) showing pulmonary arteries that do not taper normally and extend out to the pleural surface and juxtapleural telangiectasia bilaterally (Clinically significant HPS ?type 1?). 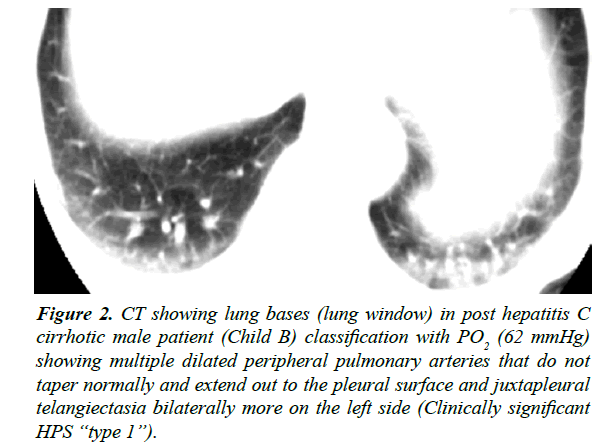 Figure 5: CT showing lung bases (lung window) in post hepatitis C cirrhotic male patient Child C classification with PO2 (89 mmHg) with multiple dilated peripheral pulmonary arteries that do not taper normally and extend out to the pleural surface and juxtapleural telangiectasia unilaterally (right side) (Subclinical HPS). 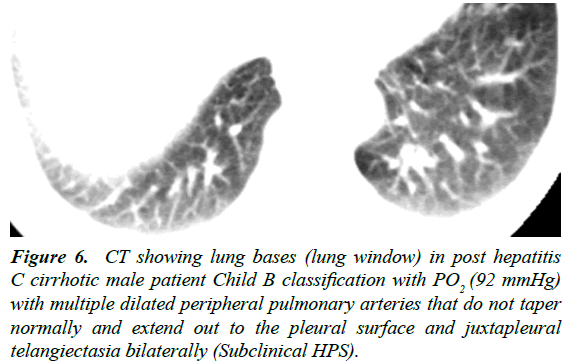 Figure 6: CT showing lung bases (lung window) in post hepatitis C cirrhotic male patient Child B classification with PO2 (92 mmHg) with multiple dilated peripheral pulmonary arteries that do not taper normally and extend out to the pleural surface and juxtapleural telangiectasia bilaterally (Subclinical HPS). Hepatopulmonary syndrome, a liver induced lung vascular disorder, consists of a triad of hepatic dysfunction, intrapulmonary vascular dilatation and hypoxemia (PO2 less than 70 mmHg) [10,11]. Hepatic patients with intrapulmonary vascular dilatation that are normoxemic are said to have subclinical HPS or intra pulmonary vascular dilatation syndrome (IPVDS) in contrast to overt or clinically significant HPS patients that fulfill all three criteria of the triad. The primary objective of this study was to use MSCT to conduct a survey among post hepatitis C cirrhotic patients to detect the prevalence of HPS in a country plagued by HCV and its consequential cirrhosis. Patients were referred to the radiology department of NHTMRI for CT abdomen and pelvis (with oral and IV contrast) and their lung bases were scanned for features of HPS. This study involved 63 Egyptian patients; 40 males and 23 females, with an average age of 54 years.37 patients (58.7%) had positive CT findings., 19 patients (30.1%) showed positive CT findings and hypoxemia (PO2 <70 mmHg) i.e., overt or clinically significant HPS, 18 patients (28.6%) had positive CT findings but were normoxemic defined as subclinical HPS or IPVDS and 41.3% (26 patients) were negative to both CT findings and hypoxemia. In a prospective study very much similar to ours with the only difference being that patients were scanned for pulmonary vascular dilatation by contrast enhanced transthoracic echocardiography rather than MSCT conducted [12-15], 54% were positive for intrapulmonary vascular dilatation. 20% were defined as clinically significant HPS while 34% were said to have subclinical HPS, results very consistent with ours . In the study of 56 patients carried out by Lima et al., 25 patients (45%) tested positive for intrapulmonary vascular dilatations but only 9 patients (16%) fulfilled the criteria for HPS . However, De et al., study of the clinical and hemodynamic aspects of HPS in forty five Indian patients with cirrhosis showed only 4 patients (8.9%) with intrapulmonary vascular dilatation including three (6.7%) with clinically significant HPS and one 'subclinical' case (positive contrast echocardiography without hypoxaemia). In other words, the frequency of HPS was relatively low . In the literature, reports of occurrences of HPS have rates ranging from 5% to 32%. These considerable variations in frequency found in studies on HPS can be explained by different geographical origins of the study; the previous lack of standardization in the diagnostic criteria for defining HPS, and due to different thresholds used for the definition of deoxygenation. The fact that 94.5% (35 patients) showed CT features of type 1 HPS while CT features of type 2 HPS were depicted in only 6.5 (2 patients) agrees with Ryu and Oh, who stated that type 1 is the most common representing 86% of cases with only 14% of cases being of type 2 . In our study of 19 patients with overt or clinically significant HPS, 21% (4 patients) were Child B and 79% (15 patients) were found to be Child C. The 18 patients with subclinical HPS were 94% (17 patients) Child B and only 6% (1 patient) Child C. Results that clearly show a significant relationship between the severity of liver disease, as assessed by Child Pugh score, and development of clinically significant and subclinical HPS. In study, HPS patients (17 in number) were 35.2% Child’s B and 64.7% Child’s C proving that patients with HPS had more severe cirrhosis. Other recent reports that confirmed the association of HPS and severity of liver disease include [12-15]. Most importantly, patients with subclinical HPS bear the risk of developing clinically significant HPS during the course of their disease however, additional data regarding this concept warrants further assessment and a wider study scale. To sum up, in the study conducted, MSCT scans of the abdomen that are unavoidably used to assess cirrhotic patients provided findings impressive of HPS or IPVDS via evaluating the scanned lung bases. This eliminated the need of waiting for a hepatic patient to present with hypoxemia and other clinical manifestations of HPS before being referred to a cardiologist for an operator dependent contrast enhanced transthoracic echocardiography for the diagnosis of intrapulmonary vascular dilatations. We could conclude that HPS should be ruled out in a patient with hypoxemia and chronic hepatic disease and knowledge of such a syndrome is essential to formulate a diagnosis – thus influencing therapeutic strategies. Management should equally involve pulmonologists, hepatologists and, in particularly severe cases, transplant surgeons in a multidisciplinary approach. Patients with HPS are given a higher priority on the waiting list for liver transplantation based on the observation that liver transplantation outcome may be poorer in cases of advanced disease. Without liver transplantation the prognosis for HPS is poor with mortality usually because of complications of the hepatic disease rather than to a primary respiratory event. El-Zanaty F, Way A. Egypt Demographic and Health Survey. El-Zanaty and Associates and Macro International. Egyptian Ministry of Health, Cairo, Egypt. 2009:431. Schuppan D, Afdhal NH. Liver cirrhosis. Seminar. Lancet. 2008;371:838?51. Ge PS, Runyon BA. Treatment of patients with cirrhosis. N Engl J Med. 2016;375(8):767-77. Conde I, Vinaixa C, Berenguer M. Hepatitis C-related cirrhosis. Current status. Med Clin (Barc). 2017;148(2):78-85. Huo TI, Wu JC, Lin HC, et al. Evaluation of the increase in model for end-stage liver disease score over time as a prognostic predictor in patients with advanced cirrhosis: Risk factor analysis and comparison with initial MELD and Child-Turcotte-Pugh score. J Hepatol 2005;42(6):826-32. Ito K, Mitchell DG. Imaging diagnosis of liver cirrhosis and chronic hepatitis. Intervirology 2004;47:134?43. Kim YK, Kim Y, Shim SS. Thoracic complications of liver cirrhosis: Radiologic findings. Radiographics. 2009;29:825-37. Krowka MJ. Hepatopulmonary syndromes. Gut. 2000;40:1?4. Ryu JK, Oh JH. Hepatopulmonary syndrome: Angiography and therapeutic embolization. Clin Imaging. 2003;27(2):97-100. Spagnolo P, Zeuzem S, Richeldi L, et al. The complex interrelationships between chronic lung and liver disease: A review. Journal of Viral Hepatitis. 2010;17(6):381-90. Abu El-Makarem MA, Elakad A, Ali A, et al. Hepatopulmonary syndrome: prevalence and predictors in Egyptian cirrhotic patients. Tropical Gastroenterology. 2008;250-36. Lima BL, Franca AV, Pazin-Filho S, et al. Frequency, clinical characteristics and respiratory parameters of hepatopulmonary syndrome. Mayo Clin Proc. 2004;79:42?8. De BK, Sen S, Biswas PK, et al. Clinical and hemodynamic aspects of hepatopulmonary syndrome in Indian patients with cirrhosis. J Gastroenterol Hepatol. 2000;15:412-16. Shafiq M, Khan A, Alam A, et al. Frequency of Hepatopulmonary Syndrome in Cirrhotic Patients. Journal of the College of Physicians and Surgeons Pakistan. 2008;18(5):278-81. Alizadeh AH, Fatemi SR, Mirzaee V, et al. Clinical features of hepatopulmonary syndrome in cirrhotic patients. World J Gastroenterol. 2006;12(12):1954-6.